BT has given a massive £200 million boost to the Derbyshire economy in the past year, according to an independent study published today. The report, by Regeneris Consulting, highlights the huge local impact of BT’s activities including its takeover of EE, which has reinforced the communications company’s position as one of the region’s leading employers. It revealed BT supported around 9,900 jobs in the East Midlands – of which around 2,600 are in Derbyshire - through direct employment, spending with contractors and suppliers and the spending of employees. Richard Blackmore, CBI’s East Midlands director, said: “This latest research demonstrates the extent to which BT plays a key role in our local communities. There is not a businessperson or family in this region who – directly or indirectly – is not affected by BT’s activities as a supplier of essential services, such as superfast broadband, major employer, investor or purchaser. Nearly 4,200 people are directly employed by BT and its EE business in the East Midlands – equivalent to one in 10 employees working in the region’s IT and communications sector. In employment terms, BT and EE’s impact in the 2015-16 financial year was larger than the region’s research and development sector. Around £238 million was spent with East Midlands suppliers– including £73 million in Derbyshire. The overall economic impact of BT and EE activities is expressed as a “Gross Value Added” (GVA)* contribution. For the East Midlands this combined GVA totalled £770 million – equivalent to £1 in every £130 of the region’s total GVA – of which more than £200 million was in Derbyshire. Owen Moody, BT’s regional director for the East Midlands, said: “Few organisations have a more positive and direct impact on the local economy and Derbyshire communities than BT. “The acquisition of EE means we can invest even further, enabling people living and working in the county to get access to the best communications - fixed line, mobile and broadband services - now and in the future. The report highlights that BT, including EE, was responsible for the employment of nearly 4,200 people and contractors in 2015-16 across the East Midlands – including more than 1,000 in Derbyshire - with a total income of around £130 million, and providing work for a further 5,800 people through spending with businesses that supply equipment and services, as well as through the spending of its staff. 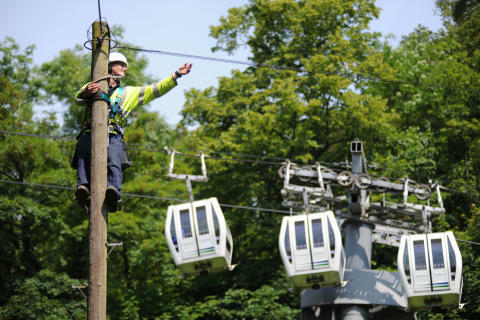 Openreach – BT’s local network business – which provides services for hundreds of communications companies and their customers, recently announced it had completed the recruitment of around 60 extra engineers in the East Midlands to help install new lines and clear faults more quickly. The new recruits are also working on rolling out fibre broadband to more households and businesses beyond the 1.9 million premises in the region, which already have access to the high-speed technology. BT’s investment of more than £3 billion in fibre broadband across the UK includes the Digital Derbyshire broadband partnership between BT and the county council that has already made fibre broadband available to more than 97,000 homes and businesses across the county. The company is also aiming to make ultrafast broadband available to up to 12 million UK homes and businesses by the end of 2020 using G.fast and fibre to the premises (FTTP) technologies. A pilot scheme was recently announced for Derby.